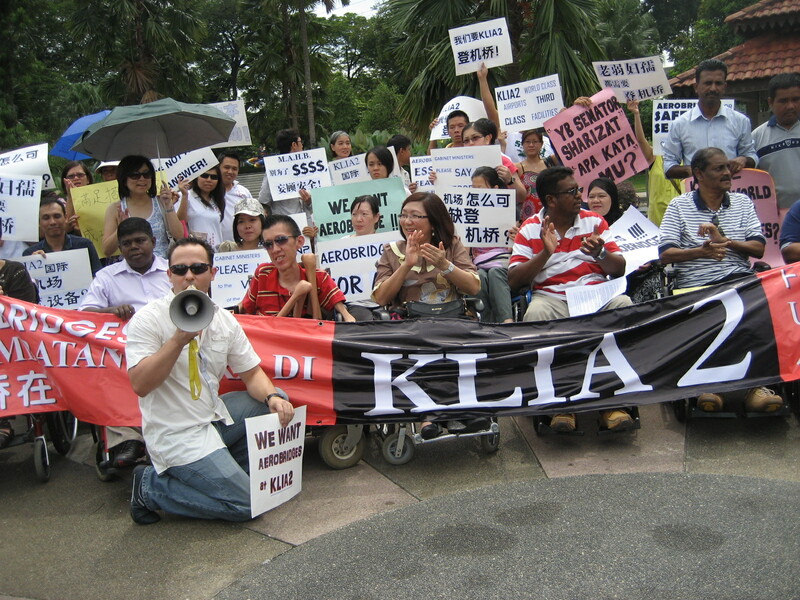 Disabled persons protesting against AirAsia a few years ago. Updates @ 3 pm 7-1-2014: A disabled person called yours truly to publish the actual cost for using the wheelchair per trip so that the Government and the Ministry of Transport will be made aware of how AirAsia treated its disabled passengers. He was hoping that the Government will put a stop to this high charges as a form of indirectly discriminating against disabled person from travelling on AirAsia flights. It cost a disabled person RM120 for one way and RM240 return trip for using the wheelchair service from AirAsia. It is to be noted that wheelchair service from check-in to the aircraft is provided by all airlines. Thank you MAS for providing free wheelchair service to its disabled passengers. Syabas MAS! It was most shocking to learn that AirAsia is charging disabled person RM60 if he or she needs to use the wheelchair. Such astronomical charges amounted to indirect discrimination against the disabled person. It was reported in Sarawak Tribune. Please see below for the said report . The said full report is reproduced below. Even the previous charges of RM12 shouldn’t be allowed by the Ministry of Transport as all airlines using Malaysian airports must be made to be disabled friendly. It is hoped that the Ministry of Transport should immediately direct that AirAsia to stop charging disabled, elderly, incapacitated and pregnant persons for the use of wheelchair. Look at the danger posed to the disabled person. Just imagined if the disabled were to fall from the top of the stairs and the untold miseries would be inflicted on the disabled! This picture must have been taken before 2008. When Tan Sri Tony Fernandes said that AirAsia doesn’t want aerobridges in KLIA2, the disabled persons made their stand. 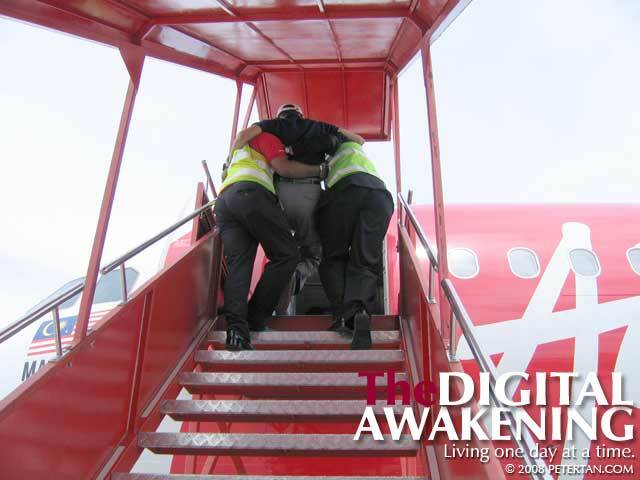 Prior to 2007, AirAsia had a history to having to carry a wheelchair bound person up the stairs to the aircraft which has posed danger to the disabled. The disabled person protested in big numbers and caught the attention of the government. On 16-7-2007 even the then Minister of Transport, Datuk Chan Kong Choy, who is a closed friend of Tan Sri Tony Fernandes and friendly to AirAsia, was upset with AirAsia on the issue of the handling disabled persons, in HERE. Look at how Tony Fernandes pacified the disabled with his promise. 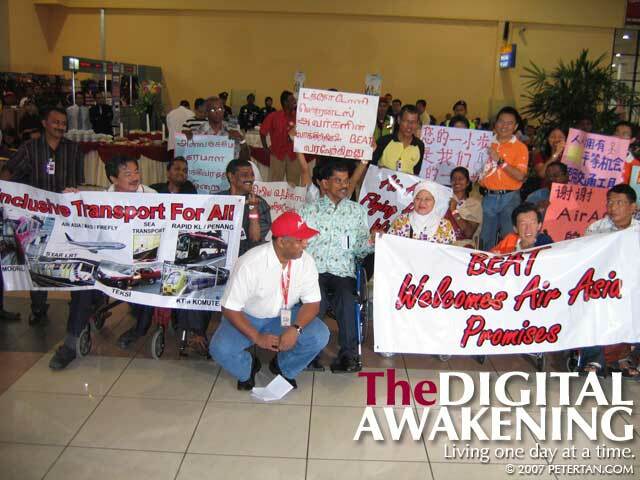 In April 2008 Tony Fernandes had this to say “It is great to finally see that our disabled friends are able to fly with us more comfortably today with the assistance of the ambulifts and aisle wheelchairs, in HERE. Thereafter, AirAsia appeared to be disabled friendly. As usual another publicity stunt by Tan Sri Tony Fernandes to pacify the disabled persons. He was seen visiting a group of disabled persons HERE. In December 2011, the AirAsia CEO Tony Fernandes, who has been a vocal opponent of the use of aerobridges, said that “his planes will not be using the aerobridges even if they were built at KLIA2. He claimed it was a waste of money as customers did not want them”, in HERE. There were a lot of pressures on MAHB on this matter, HERE. If AirAsia is so deadly against aerobridges at airport due to cost and not in accordance with its “business model”, then it and AirAsia X shouldn’t be using aerobidges in airports in other countries like Thailand, China, Japan, Australia and etc. Aerobridges is a basic convenience for all passengers and airport security. Yours truly is glad that Tan Sri Bashir and others in MAHB did not succumb to the pressures and publicities generated by Tan Sri Tony Fernandes. Yours truly hopes that BK Sidhu of the Business Star would pick up the story that AirAsia is charging the disabled RM60 for using the wheelchair. Lets see whether such adverse story will appear in the Star. Last week, my family, including my two in-laws who are both in their 80s, went to Kota KInabalu, Sabah for a visit. Upon arrival at the Kuching International Airport (KIA), I enquired on the use of wheelchairs for my in-laws. Can you imagine the surprise that I got? Each of them were charged RM60 per wheelchair so they have to pay RM240 for a two-way use of the wheelchairs that at KIA/Terminal 2 Airport, Kota Kinablau/KIA! It was only last year that they paid RM12 each for a similar two-way use of the wheelchair from KIA/LCCT Sepang/ KIA. In a respect of all senior citizens who have to use wheelchairs, I sincerely hope that Air Asia would review and reduce the high price of using the wheelchair service at all airports in the country. Please be aware that those who need the wheelchairs are those who are old, frail and feeble and walk at a slow pace, using walking sticks like my two in-laws and the sick. Only those with OKU certificate are exempted from the fee. It is certainly not for fun, so charging RM120 each for the use of the wheelchair for a return trip is really a burden to them (and to all senior citizens) who do not earn anymore income. In the case of my in-laws who are feeble and walked at a slow pace, they really need the aid of the wheelchair to help them to move faster to the departure hall and when boarding the aircraft so as not to obstruct those walking behind them. My mother-in-law also underwent a total knee replacement surgery five years ago. And not only that, I was also asked to help push one of them all the way to the departure hall at both airports. When queried further, the counter staff said the price was increased recently and the wheelchair belonged to Air Asia and not Malaysia Airlines (MAS), so why the need to charge such a high rate. In Kuching, the price of a wheelchair is between RM300 and RM450 which makes Air Asia getting good profit from those senior citizens and others who really need to use the wheelchairs. Please, Air Asia, do spare a thought for the senior citizens. It is hoped that the disabled persons affected by the high charges that was arbitrarily imposed upon them should lodge a complaint to Ministry of Transport and Damai Disabled Person Association Malaysia. Instead of shooting from the hip, as you are wont to do, why not check the facts? First, it’s not the business of an airline, be it full service or low cost, to provide wheelchair assistance to it’s passengers. That is the responsibility of the airport authorities and the airline’s ground handlers. You need go no further than Changi Airport to see how this works. 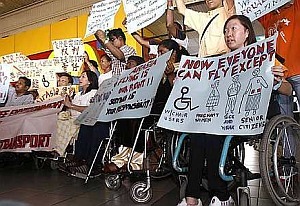 SIA, Silkair and Tiger Airways don’t provide wheelchair assistance at Changi. All requests for wheelchair assistance are directed by the airlines to their ground handler at Changi, which in this case is SATS. SATS then liaises with the airport authorities (CAG) to provide the required assistance. So, what point are you trying to make here? If it is the service of airport authorities, then what the heck that Air Asia wants to charge RM 60 for using the wheelchair? Am I missing something? Giving equal access should not be a business decision but a moral obligation if we want our society and nation to grow as a whole. Looking after the disabled is also a corporate responsibility. Disabled persons need more help. Don’t talk about moral to Tony. It is not his vocabulary. He is only interested in profits at all costs. The only way to teach him a lesson is for the public to stop using AA. Let use Malindo and MAS instead of that low caste airline. Teach that pariah a good lesson. He will only learn when it affects his pocket. There is no option to boycott AA since they are still the cheapest in the market to enable me and my family to fly. Still the “cheapest” with hidden cost! Any refund will take months to get. Telephone call to AA office will take a long time to be attended too. Zero service. Tony Fernandes had said that “if you price the ticket low enough, Malaysians are prepared to risk their lives”! Best of luck to you and your family. Wheelchair service should be free if AirAsia is disabled friendly. What is the point of taking photo with the (disabled) protesters and promised them with facilities. A few years later charge them RM60 for the use of wheelchair. RM60 is a lot of money to the disabled and elderly persons. I agree that no point to talk about MORAL to Tony Fernandes, his only interest is MONEY and nothing else. The NST readers were so touched. They were all asking about how to go about giving assistance to Nur Damila who is a disabled kid. Of course, the pariah will think that we are stupid to care for the disabled. He and his organisation must be thought a good lesson. Lets fly MAS or Malindo. You will be surprised the difference in the fare between AirAsia and them are not that much when the hidden cost like wheel chair service and etc are taken into account. RM240 for wheelchair service is daylight robbery! God forbids! Is this how an airline treated its disabled passengers? Was this what was promised by Tony Fernades in 2008 when he meet the disabled person protesters at LCCT? YB please demand from the Government to take actions against AirAsia over this high charges for wheelchair service. This Tony lacks of moral duties. RM240 service fees for wheelchair used by disabled person is more than daylight robbery! How could the Ministry of Transport approved such a high fees that will no doubt bring hardship to the disabled persons? It is never too late the Government must step in now and stop the charge of RM60 and to order that the low caste airline to refund all such charges collected to its passengers. This is in line with Rkyat diDahulukan! In short, if you are a disabled, don’t you try to fly with AirAsia ok unless you pay through your nose the exorbitant service fees of RM60 per trip. This is how disabled friendly AirAsia is. Don’t ever trust that Tony. He will say anything and renegade later. Every corporation try its best to be disabled friendly by providing special ramp to its office or outlets, special toilet, special service at no cost for the disabled except AirAsia. The only company is having problems with such important service to the society. Why don’t you check your fact. Who is the ground handler for air asia? isn’t it air asia? At changi the ground handler is not the airlines. Who pays for the wheelchair – passenger or airlines? the ground handler is organising the availability and the logistics. at klia the ground handler for mas is mas and the ground handler for some foreign airlines is klas. Corporate social responsibility is an obligation. For Tony Fernandez and AirAsia, it has never been a case of corporate social responsibility. It is all about personal gain and profit – ruthless and without scruples. No want to use aerobridge? Tell that to the airports in Singapore, Australia and so on that it is not their business model! They will rant and bully only in Malaysia. You don’t talk to Tony about corporate responsibility to our society especially for the disabled. He only know how to spin stories to suit the situation and corporate profit period. He has been enjoying good run when Slumberjack was in power. Now he had to compete with Malindo and MAS. The end is near with debts of more than RM5 billion and few hundred airbus on order. There will be a time where creative accounting will not work no more. Th government must do something about this fella.He must be thought a good lesson by the passengers for taking them for granted. Airlines making use of Malaysian airports must be made to have social responsibilities towards the disabled including the handicapped, elderly, young children and pregnant women. The Ministry of Transport must constantly monitor AirAsia on its so-called business model that put money above everything including disabled persons and safety. Had a brilliant time at the Nepean Expo – great to see so many people and hear so much positive feedback! Can’t wait for the next one! Just my $0.02, AA doesnt charged for disabled pax with OKU card but the fee is for those without it but request for the service. Needless to say, those who will be charged is the ones that actually can walk even a bit feeble, slow pace but still can walk. In a way it’s also to deter from people abuse the service. As of this week, nothing has changed. Air Asia still charged my elderly parents a fee for wheelchair service. This is a disgusting and immoral policy, and should not stand in this or any other country. Sir, this obviously effects a great many of our citizens, including veterans like my father. It is tremendously appalling that, they are able to treat veterans who have sacrifice so much, this way. Since Tony Fernandez, and Air Asia refuse to budge on this policy, is there anyway, Parliament can enact a law that make such discriminatory practices illegal? Thai Airasia Flight Chiang Mai-Phuket last wednesday in the evening. The flight did not use the aerobridge in Phuket, and I was carried down the stairs by four people. I was very very scared. Even no aisle chair if during the flight I needed the toilet. It doesn’t make sense : how many people would need an ambulift? One out of 10,000? Even if the cost for airasia would be 1,200 ringgit, it would be sufficient to spread the cost on all passenger increasing the fare by 12 sen, let’s say 1 ringgit. Hi, I want to know ist free wheelchair in klia 2? Taking malindo flight. You will understand the pain if you have a family member or friend who needs the assistance of wheelchair service. Looking forward to the day when this value added service is provided on FOC basis and that we the society as a whole do care and look into the needs of the less privilege.